This cute sequin party dress has a great flattering cut that looks great on everyone! The Shimmer of Hope Rose Gold and Black Sequin Party Dress is fully lined. It has a V neckline, cap sleeves, and an empire waist. The top is made of miniature sequins in rose gold and silver. The attached skirt is made of black chiffon and has a flowy cut. A hidden back zipper completes this dress. 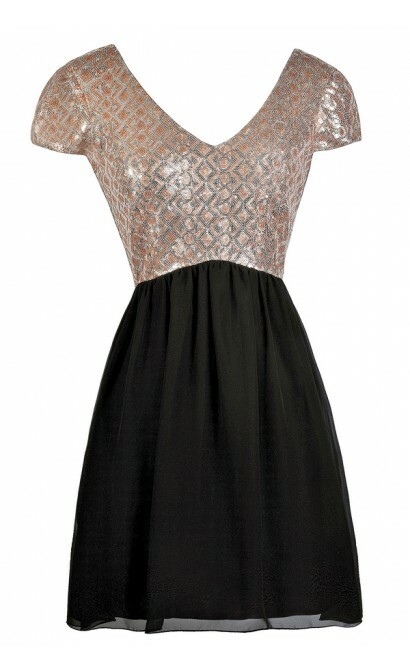 The Shimmer of Hope Rose Gold and Black Sequin Party Dress is perfect for your next night out! Pair it with black pumps and a metallic clutch for a party perfect look! Details: Fully lined. Hidden back zipper. 100% polyester. Hand wash cold water, inside out. Use only non-chlorine bleach when needed. Line dry. Do not iron or steam. Size 3 measurements: Length from top of shoulder to hemline: 33". Bust: 34". 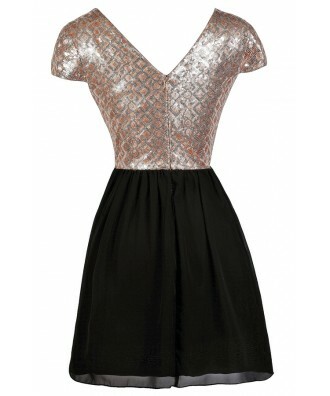 You have added Shimmer of Hope Rose Gold and Black Sequin Party Dress into Wishlist. You have added Shimmer of Hope Rose Gold and Black Sequin Party Dress for Stock Notification. 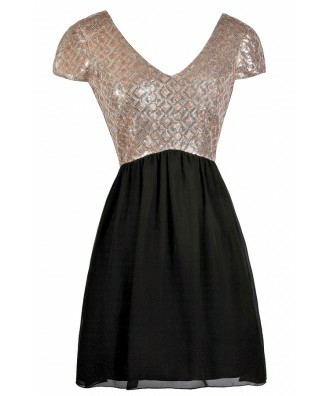 You have set Shimmer of Hope Rose Gold and Black Sequin Party Dress as a loved product. You have removed Shimmer of Hope Rose Gold and Black Sequin Party Dress as a loved product.